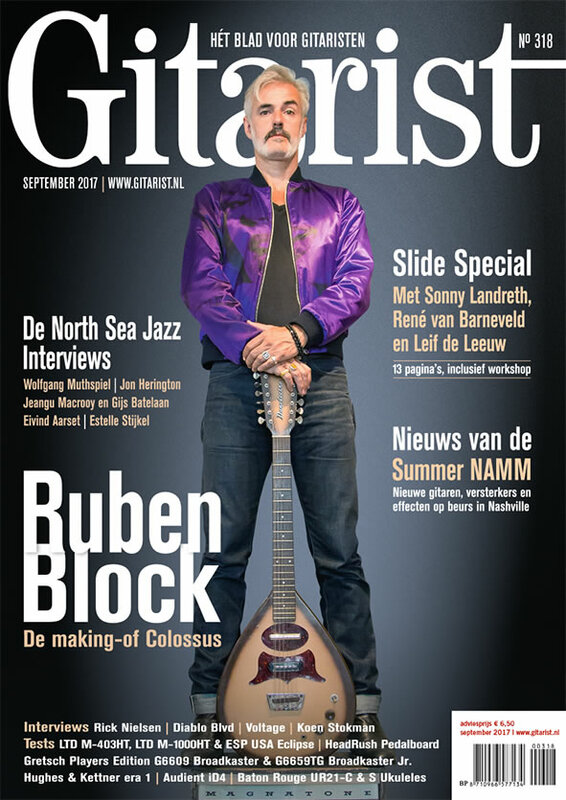 Triggerfinger frontman Ruben Block graces the cover of Gitarist this month. Their brand new album ‘Colossus’ is of course the reason why we put him on the cover. I am glad to say that I am the one who provided the interview. It was fun talking with Ruben about the recordings of the album as well as his vast collection of interesting guitars, amplifiers and effects. 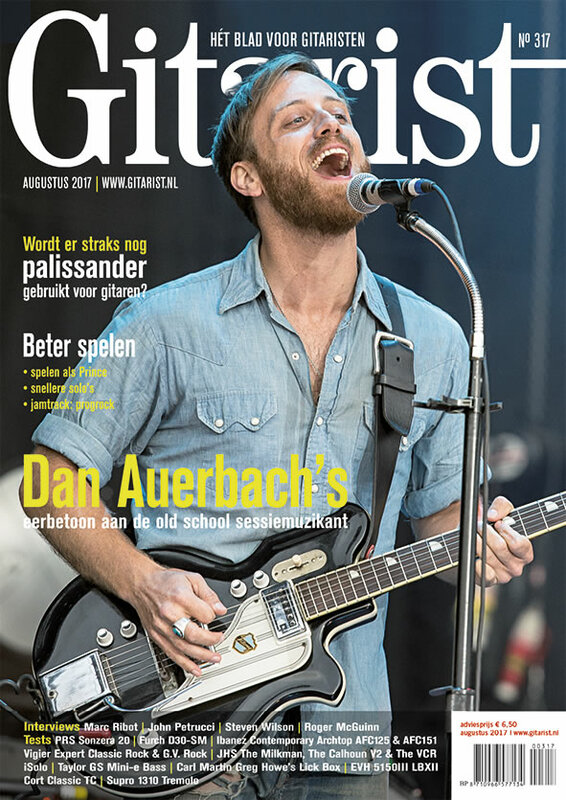 This Belgian trio is one of the friendliest, most polite groups I have ever had the pleasure of interviewing and if you are at all interested in them, I would strongly recommend getting this month’s issue of Gitarist in order to read all about them. That is not all though. I also went to the North Sea Jazz festival for the magazine in early July. I had the opportunity to speak with six musicians from five wildly different acts there. Wolfgang Muthspiel is probably the most traditionally jazzy, although this Austrian guitarist also has a lot of classical influences. Eivind Aarset from Norway is a big name in modern guitar jazz and a friendly guy with whom I enjoyed talking about his playing and his enormous number of effects. Jon Herington has been playing with Steely Dan for eighteen years and gave me a lot of interesting insights in his other musical endeavors. Then there are the Dutch artists. Jeangu Macrooy overwhelmed me with his amazing debut album ‘High On You’ earlier this year and I had the chance to speak with him and his lead guitarist Gijs Batelaan at the festival, while I have already known Estelle Stijkel for many years due to her involvement with The Jacks. She was at North Sea Jazz to accompany Kovacs at a show that was possibly the most pleasant surprise of the weekend. And that’s just what I contributed, along the reviews section that includes a big review on the amazing new album by For All We Know, the solo project of Within Temptation guitarist Ruud Jolie. There is also a big special about playing slide guitar, which also includes former Urban Dance Squad guitarist René van Barneveld and the amazing young blues/rock/prog guitarist Leif de Leeuw. My colleage Patrick spoke to Diablo Blvd. about their new album and there’s loads of new gear to discover. That will get you through the month! Ever since resuming activities early this century, Cloven Hoof went through so many lineup changes, that I was not very hopeful about the recent ones. Sure, bassist and band leader Lee Payne is very enthusiastic about George Call’s voice, but anyone would say that about their new singer, right? This time, it is justified. 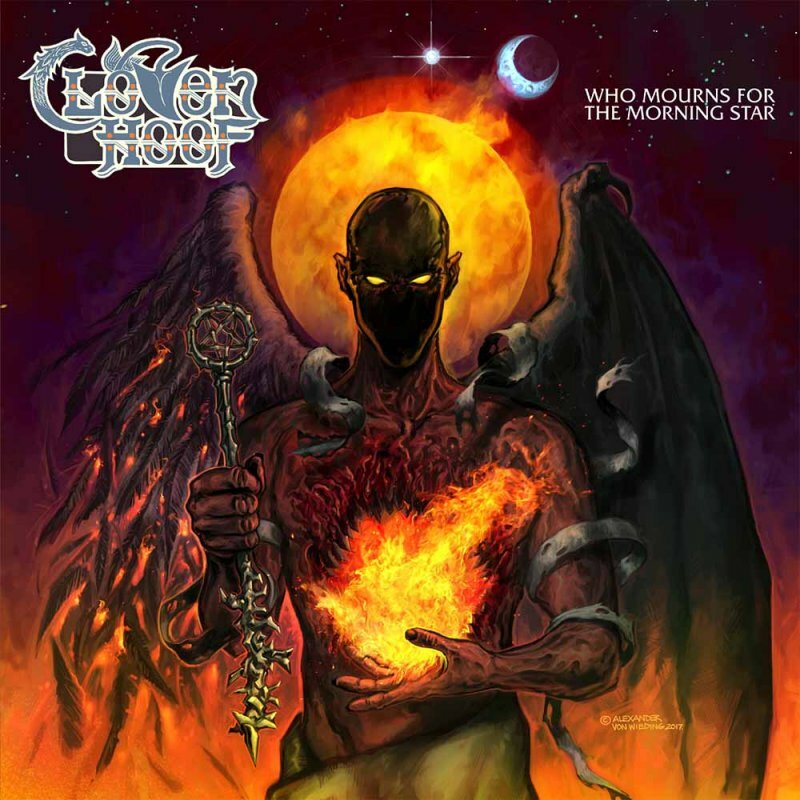 Call is one of the reasons why ‘Who Mourns For The Morning Star’ is such a great album. He comes very close to Russ North as Cloven Hoof’s best singer. In addition, the record features some of the most spirited, enthusiastic heavy metal performances I have heard in a while. Compositionally, the songs on ‘Who Mourns For The Morning Star’ are a mixture between the NWOBHM approach that Cloven Hoof had in the early eighties and the USPM-leanings they had a couple of years later with North at the helm. If you are looking for a close reference in style, the recent Accept albums are not too far removed from this record in overall feel. Cloven Hoof just employs a greater deal of variation in the tempos. There are a few more than passing nods to Judas Priest and Iron Maiden, the latter enforced by the fact that Call strongly resembles Bruce Dickinson in his higher registers. Some people may complain about a few somewhat chaotic middle sections, but those are a staple of Cloven Hoof’s sound as much as the ballsy riffs – which, due to the spectacular production, grind more ferociously than ever – and anthemic choruses. While opening track ‘Star Rider’ may resemble ‘Astral Rider’, which opened the amazing ‘A Sultan’s Ransom’, in title, it is much more of a traditional heavy metal track with spectacular guitar work and Call showing off his clean, but rough vocal approach. It is the perfect way to introduce the album to unsuspecting listeners. The rest of the album varies from straightforward heavy metal with a slight hardrock edge, such as ‘Neon Angels’, ‘Song Of Orpheus’ and the Motörhead-ish scorcher ‘Time To Burn’, and songs with a somewhat more progressive approach, such as ‘Song Of Orpheus’, ‘Morning Star’ and closing track ‘Bannockburn’. The latter is the least successful track here: while the main section – including the Maiden-est chorus on the record – is good enough, the rest of the composition sounds more like ideas pasted together rather than an actual song. ‘Mindmaster’ borrows a fragment from Halford’s ‘Locked And Loaded’ somewhat obviously, but since the – surprisingly modern – song is kind of cool, I will let that slide. While I was somewhat reserved about Payne’s enthusiasm, ‘Who Mourns For The Morning Star’ proves that it was justified. Call is simply a revelation, young newcomer Luke Hatton really goes wild on some of the lead guitar parts and Danny White – Call’s bandmate in Aska – is easily the tightest drummer the band has had in the 21st century. But this album really shines because of how effortless and natural it sounds. It simply sounds like a band having fun playing the music they love rather than trying to adapt to any trend or forcing the magic of their heyday. And that is all I want from Cloven Hoof at this point in their career. Some of Anthem’s best records have something awkward to them that has nothing whatsoever to do with the actual music. ‘Immortal’ has its album cover, ‘Domestic Booty’ its title. And maybe the fact that the band broke up for about a decade in the aftermath of this album’s release. Changes in the musical trend department are often cited as the reason for that hiatus and anyone who has heard ‘Domestic Booty’ can safely conclude that the quartet was certainly not running out of inspiration. The record is full of blazing heavy metal songs, some of which are among the best of Anthem’s catalogue. 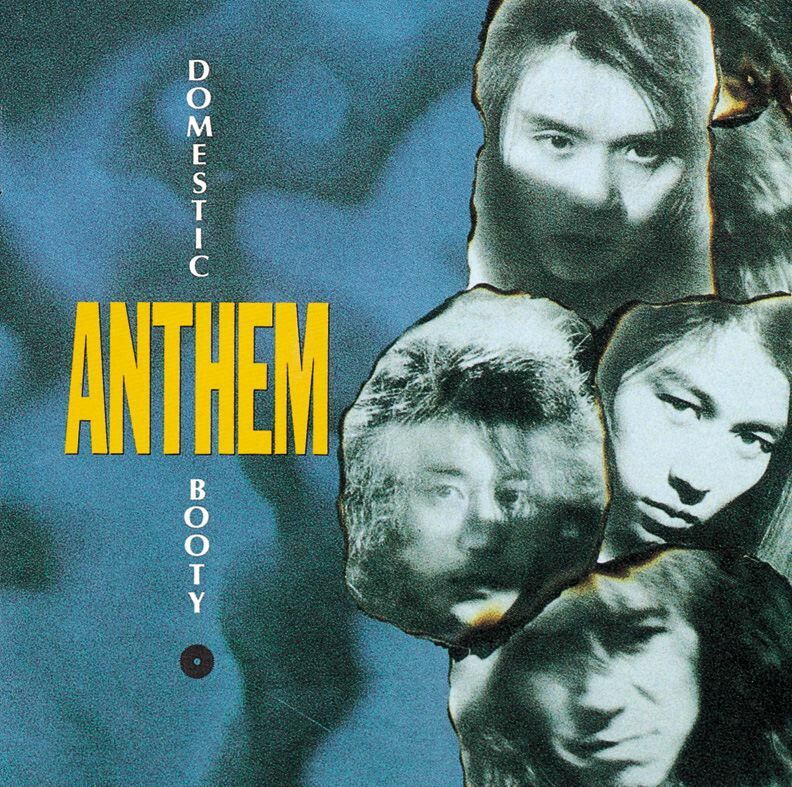 While ‘Domestic Booty’ isn’t the most consistent record of Anthem’s original run – that would probably be ‘Bound To Break’ – they do sound like a band rejuvenated on the album. Frontman Yukio Morikawa truly shines with his most aggressive and energetic vocal performance thus far, while newcomer Akio Shimizu, who is still the band’s guitarist these days, lends a subtle contemporary edge to the record without altering the powerful, not too complicated heavy metal compositions of bassist and band leader Naoto Shibata too much. It is truly difficult to believe that the band creating this music would split up less than a year later. These days, opening track ‘Venom Strike’ is still on most Anthem live sets and its classic status is easy to understand. This borderline thrash metal song with rolling bass drums by Takamasa ‘Mad’ Ouchi is probably the most aggressive Anthem song to date and therefore begs to be played live. Even better, but not quite as popular, is the intense, moving heavy metal of ‘Renegade’, which has probably the best chorus the band recorded with Morikawa on vocals and really showcases the guitar talents of Shimizu. Sure, there is some awkward English going on, but that should not ruin the listening experience. Since these two tracks open the record, it may seem a tad frontloaded, but there is plenty more to enjoy. ‘The Dice Of No Mercy’ is one of the darker Anthem tracks yet and as such, a very pleasant surprise. The euphoric ‘Cry In The Night’ and the brooding ‘Gold & Diamonds’ greatly profit from the subtle synth flourishes courtesy of current Deep Purple keyboard player Don Airey and the uptempo triplet frenzy of ‘Devil Inside’ is exactly what the album needs at that point. But even the less notable tracks, such as mid-tempo stomper ‘Mr. Genius’ and the semi-epic closing track ‘Silent Cross’, are very much worth hearing. If Anthem would have definitively called it a day after the release of ‘Domestic Booty’, it would have been a great closing chapter to a strong career in heavy metal. Nowadays, it sort of gets lost in the shuffle, because Anthem has released seventeen albums to date and the record spawned only one live staple. If it was up to me, ‘Renegade’ would at least have been one as well. Farwell albums, even if the farewell eventually turns out to be temporary, often feel like a bit of an afterthough. ‘Domestic Booty’, however, is another excellent Anthem record. Not one of their best, but it’s pretty damn close. Guitarist Joe Perry is often seen as the one who guards Aerosmith’s musical integrity next to Steven Tyler’s showmanship. Anyone with some in-depth knowledge about Aerosmith knows that grossly oversimplifies the band’s complicated dynamic, but it is a fact that during the Perry’s time away from the band, Perry released two excellent albums with The Joe Perry Project while Aerosmith released one mediocre record. 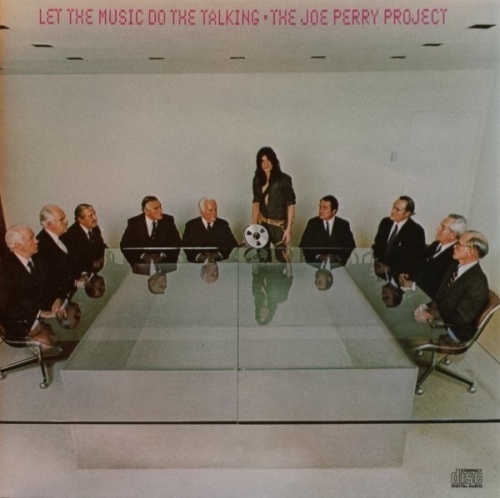 And while sophomore album ‘I’ve Got The Rock ‘n’ Rolls Again’ of Perry’s project may have higher peaks, ‘Let The Music Do The Talking’ is one of the most consistently engaging bluesrock records of the early eighties. First off, the title of the album is not without meaning, of course. It could be interpreted as a provocation towards Aerosmith, but it could also just represent the fact that Perry burned all the bridges behind him and decided to just focus on what he likes doing best in the first place: making music. Regardless, Perry sounds like a man unburdened on ‘Let The Music Do The Talking’. There is a spontaneity to this debut that some of the late seventies Aerosmith albums lacked, no matter how good they were. The songs sound raw and energetic, but not underdeveloped. Another reason why ‘Let The Music Do The Talking’ sounds so fresh and spirited is the fact that Perry put together an excellent band. Nowhere is this more obvious than during the short, high octane instrumental ‘Break Song’. Drummer Ronnie Stewart and bassist David Hull are perfectly in sync with each other and Perry, ending up sounding positively on fire. The upbeat, uptempo closer ‘Life At A Glance’, the massive and somewhat dark ‘Shooting Star’, the swinging boogie of ‘Discount Dogs’ and especially the powerful, catchy title track that opens the record profit from the tight, spirited interplay of The Joe Perry Project. In addition, adding a lead singer to his project was a great idea from Perry. His own voice is cool and a perfect fit for the dark, bluesy ‘The Mist Is Rising’ and the sarcastic tone of the strong rocker ‘Conflict Of Interest’, but his range is not particularly wide. The higher, more powerful registers of Ralph Morman are the perfect fit for songs that demand some more vocal prowess. His clean voice has a slight raw edge, which really lifts songs like ‘Let The Music Do The Talking’ and the otherwise somewhat mundane ‘Ready On The Firing Line’ to higher level. His duets with Perry work remarkably well too and should maybe have been featured more prominently here. Without the big budget and the business acumen of Aerosmith’s management, ‘Let The Music Do The Talking’ never quite took off the way it should have, but the album is still available and very much worth checking out. Somehow, the record still sounds fresh today and I suspect that Perry’s drive is largely to blame for that. It may be a cliché, but the debut album of his Project – capital P – does actually let the music do the talking. There may be some bitterness in a few of the lyrics, but it does not dominate the record. The strong bluesrock songs and excellent performances do. My contributions to this month’s issue of Gitarist are relatively limited in number, but still interesting. First and foremost, I had a very pleasant conversation with prog rock legend Steven Wilson about his new album ‘To The Bone’. It is surprisingly low-key and poppy, considering the way his last few releases sound, but that does not make it any less interesting. If anything, it makes a better interview subject for sure. There is also a short interview with the young “psychedelic grunge” quartet Mantra from Haarlem, whose debut EP impressed me enough to want to give them some more attention. And there is a handful of reviews, of course. In addition, I can really recommend reading the interview with The Black Keys’ frontman Dan Auerbach and the feature about the availability of rosewood. In combination with the gear reviews and the practical lessons for guitarists, there is no reason to leave this issue on the shelves if you have any interest in the instrument. It is in stores now.